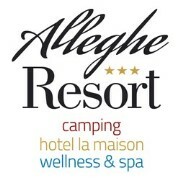 Alleghe Resort offers to the visitors of our mountains, different overnight stays. Our Hotel creates a comfortable and welcoming stay, while the campsite gives the visitor the best way to live the Dolomites. Furthermore, our "Wellness & SPA" area will make you find the meaning of the perceptions. Our campsite is located in one of the most beautiful mountain ranges of Italy, the Dolomites, just at 500 mt. from the lake of Alleghe and at only 1,500 m. from the town center. You can come here with your own tent to stay connected with nature, you can tow your caravan and get comfortable or get here with a camping car. Hotel La Maison, surrounded by a breathtaking landscape, offers 13 Junior Suites, equipped with all the comforts you need. A buffet breakfast is available in the morning, and the Wellness & SPA area will wait for you in the afternoon with its sauna, steam, whirlpool, relaxing zone and sensory showers.